Ista [which means static in Persian] is the name of a village where technology is said to have come to a halt since many years ago. In this village, a Nissan pickup is the only sign of modernity; Ista is where children are educated by their own parents and above all, where no newspaper or mobile phone, not even the Internet have been able to make their ways into the lives of villagers. At the village’s entrance, there is a white gate on which a no-trespassing sign grabs your attention. Beyond this gate, a group of people originated from Iran’s north-eastern city of Tabriz live behind an enclosed windowless clay straw wall. Some 30 years ago, these Tabrizis made up their minds, packed their belongings and left all the means and instruments of modernity behind to lead a simple life in Iran’s Taleqan County, Alborz Province, at the foothills of a soaring mountain and inside low-ceiling houses on the bank of Shahroud River. The silent bells with their hanging ropes at the door of every house attest to the fact that silence is the most striking characteristic in this village. According to their own words, they are the followers of Mirza Sadeq Tabrizi, the religious leader of Iran’s Constitutional period who issued the sternest fatwas against modernism and its achievements. In an attempt to tread on his path, the residents of this village have abandoned technology as well. It is enclosed by a long rectangle-shaped clay straw wall on which 9 wooden doors have been mounted at regular intervals. The doors, without names and numbers, are all similar in terms of height, shape and colour with hanging ropes of bells, except for two bigger doors which are the public entrance and exit of the village. A door opens up and an old man appears in a white knee-length shirt and a buff-coloured pair of linen pants. He is holding a red basket in hand, and prefers to slant down his straw hat while turning a deaf ear to our first hello; however, we received a cold welcome when he answered our second hello in undertone. 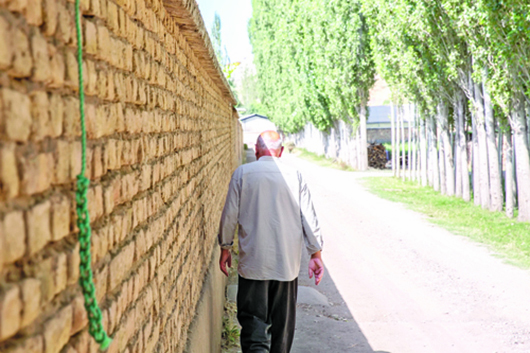 Though averse to speaking, he divulges that 9 households live behind the wall and that’s all. “False rumours are widespread about us. They said we are aggressive and combative; far from the truth!” he regretted. They own 15 hectares of contiguous lands and live in houses as big as 1,000 meters. He noted that the children of the village gain literacy as high as they can read and write and of course become familiar with Muslims’ holy book, Quran, the theology of Twelver Shiites, and actions that according to Islamic law are Halal (permissible) or Haram (forbidden) to engage in. Girls in this village get married under the Shiite Islamic Shariah law, namely in the age of 15-16. Because of the lanterns hanging on the doors of every house, shimmering throughout the nights of the village of hermits, neighbouring counties used to call it Fanoos Abad (land of lanterns). Many years later, for the first time an author and researcher named Hossein Asgari wrote a book about this village and suggested Ista (Static) as a name for the village because its people have remained static in the time before the breakthrough of technology. To men, communicating with girls and women that are non-Mahram to them (girls and women other than mother, sister, aunt and mother-in-law) is taken as a red line. “Girls and women of the village won’t come out of their homes or leave the village unless it is necessary; for example, for some medical needs that are beyond our capabilities to deal with,” he stressed. After all, they are no exception to the assumption of “necessity is the mother of invention” as a Nissan pickup has crossed the clay straw wall and won a place in the lives of the hermits. The old man explains that they did not have any cars in the village until five years ago when they had to buy one out of necessity. “The pickup belongs to all the people of the village which comes handy in emergencies,” he emphasized. The residents of the village, on the contrary to what many people may think, are among the big prosperous landowners of Tabriz who still enjoy high esteem there. The revenues from those lands pour back into their simple lives in Ista. Residents of the village look up into the sky and measure the passage of time by the movement of the sun. When it reached the middle of the sky, the old man knew it was prayer time; he thus turned towards the mosque and walked away in short steps.